The new Trijicon MRO appears to be a competitive reflex optic. Trijicon has just announced the release of their MRO® rifle optic, after its debut at SHOT Show 2017. Adding to their impressive list of rifle optics, the Trijicon MRO (Miniature Rifle Optic) is a relatively compact red dot optic designed for reflex rifle shooting, tailored for the AR-15. These types of optics have proven to be extremely valuable, especially in the close-range or close-quarters shooting situations. Trijicon has already established a strong presence for rifle optics, with their ACOG optic/scope being heavily used by U.S. armed forces in the current Global War on Terrorism. Additional high quality products like the MRO are continuing to solidify Trijicon’s place among the leading rifle optics manufacturers. The new Hogue X5 folding knife has some impressive features, and a great feel. Hogue has been making a bold move into the competitive knife market for several years now. This year at SHOT Show 2017, Hogue showed off their X5 folding knife that really caught my eye for its functionality, fit and overall quality of construction. The Hogue X5 knife was lightweight, but incredibly sturdy at the same time, with several features that should help this knife garner some serious attention. Hogue has a long and established reputation as a high quality accessory manufacturer. Everything from rifle and shotgun stocks, to slip-on pistol grips, Hogue’s highly functional molded-rubber accessories, with their combination of comfort and grip texture, have been highly favored products for years. Expanding into the knife market is a risky proposition considering the existent competition, but it is quite apparent Hogue did not jump in without doing their homework. The new Hogue knives are designed well, made with quality materials and craftsmanship, and function well for a variety of jobs. The Kershaw Eris folding knife could be viable for duty use. The new Kershaw Eris folding knife was just released at SHOT Show 2017. Though a fairly straight-forward and simple design, the new Eris has some nice features that could make it a viable on-duty or off-duty EDC pocket knife. The concept of a pocket knife has been around for perhaps millenia, but in the last 150 years or so the designs and features have changed quite a bit. From daggers to folders, and everything in between, a good pocket knife is not only handy for practical jobs, but could be a last-ditch tool for life-and-death self-defense. The YHM NITRO® 30 Stainless Suppressor comes in a nice case with (2) muzzle and rear caps. Yankee Hill Machine (YHM) was showing off their NITRO® 30 Stainless suppressor at SHOT SHOW 2017. The NITRO 30 was first shown off as a prototype at thee 2016 SHOT Show, and was finally released about mid 2016. One of the most fantastic features of the YHM NITRO 30 Stainless suppressor is its wide range of potential caliber uses, everything from .17HMR to .300 Ultra Mag. In addition, the NITRO 30 Stainless is full-auto rated to accommodate NFA tax stamp holders, military, and law enforcement users as well. 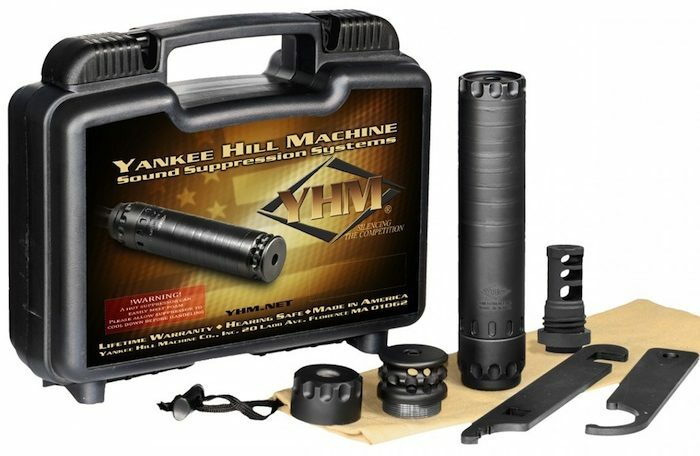 Yankee Hill Machine has established themselves among the elite firearm accessory and parts manufacturers available. The NITRO 30 Stainless suppressor is just one more contribution to firearms excellence through superior manufacturing, and so far it appears to be worthy of what we’ve come to expect from YHM. The NITRO 30 is not the first suppressor from YHM, but it is a culmination of many years of engineering and design work. If you don’t think suppressors are important or applicable, you owe it to yourself to consider our comments at the end of this post. Beretta’s new striker fired APX pistol. There was a lot of talk about the Beretta APX striker-fired pistol at SHOT Show this year, especially when the U.S. Army’s Modular Handgun System (MHS) winner was announced and revealed Beretta was no longer going to be the Army’s handgun supplier. The Beretta APX is their first foray into the full-sized striker-fired pistol market, and will be available in the United States starting April 15, 2017. Some may think it is too late for Beretta, but I disagree. Though Glock, HK, and Smith & Wesson have a strong influence in the striker-fired market, the recent additions of the Ruger American Pistol, Sig Sauer P320 (a variant winning the MHS contract), and the Remington R9, clearly show there is still room for competition and innovation in one of the most popular handgun styles today. Once you’ve read more I think you’ll agree. Sig Sauer Whiskey 5 Rifle Scopes Deliver! The Whiskey 5 rifle scopes are packed with features photo from Sig Sauer). Sig Sauer had their U.S. Army’s Modular Handgun System (MHS) contract, worth up to $580 million over 10 years. Vortex has introduced their new Viper PST Gen II line of rifle scopes. The Gen II Viper scopes expand upon the Gen I features with increased quality, performance, and magnification range. These new features are often reserved for the top of the line optics. This was a general trend at SHOT Show 2017, as most of the major rifle optics manufacturers added outstanding features to their mid-level optics. Vortex PST scopes are the company’s second line of high quality optics, with the Razor line being the top flagship models. The Vortex Viper PST Gen II scope line offers a range of magnification options. From an outstanding 1-6x24mm magnified reflex option ideal for the AR-15, to a super long-range option of 5-25x50mm rifle scope, the Vortex Viper PST Gen II line has a lot of great features for a wide range of shooters. New CRKT Rakkasan Knife Impresses! The new CRKT Rakkasan is a fantastic knife. Columbia River Knife & Tool (CRKT) has introduced the new Rakkasan fixed blade knife at SHOT Show 2017. Designed by military veteran Austin McGlaun, the Rakkasan is a very balanced multi-purpose knife, with contoured G10 grips that are both comfortable and intuitive for outstanding hand placement and hold. CRKT came to SHOT Show 2017 with nearly 50 new knives and tools on display, and quite frankly blew the major knife competitors off of the showroom floor. These new designs are coming from an ever-increasing line of high quality designers with backgrounds that vary as far as a knife user could imagine. The Rakkasan is an entry from CRKT’s “Forged by War” series, where each designer is a military veteran. CRKT also expanded their Ruger licensed knives that we’ll post on later. New Beretta PX4 Storm Finally Arrives! The new PX4 Storm Compact Carry has an outstanding grip. The new Beretta PX4 Storm highlighted at last year’s SHOT Show has finally arrived and is shipping to dealers now. Called the We posted on the new Beretta PX4 last year, and many of our readers expressed interest in the upgrades being offered. At the time Ernest Langdon was in the Beretta booth showing off the enhanced PX4 Storm that he helped to design. Originally we were told that shipment could begin as early as 2nd quarter of 2016. As we all know now, that did not happen. Unfortunately for Beretta and PX4 fans, the pistol just never seemed to materialize. Well I visited the Beretta booth again this year, and once again talked with Ernest Langdon. When I asked him about the new PX4 Storm from last year he smiled and pointed to a display counter. 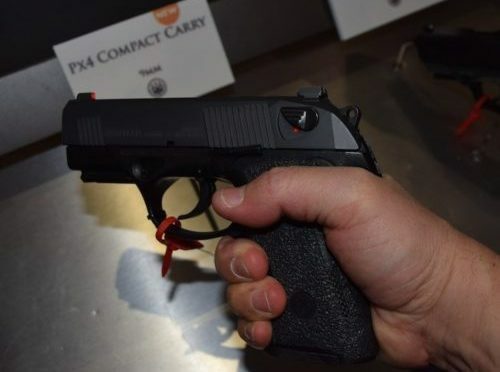 There was the upgraded PX4 Storm Compact Carry, with an official “New” label from Beretta. According to Langdon, the new PX4 Storms are being shipped to dealers now. The new U.S. 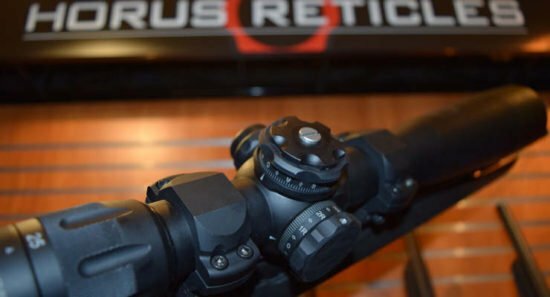 Optics B-Series scopes will have a Horus reticle option. U.S. Optics was ready at SHOT Show this year with (3) new rifle scopes. Their new B-Series rifle scopes are packed with outstanding features that truly separate high-end glass from ordinary rifle scopes. I was able to talk with U.S. Optics marketing representative Maggie, and she described the technological advancements of the U.S Optics B-Series scopes. The new U.S. Optics scopes are the B-10, B-17, and B-25 rifle scopes. Each scope derives its name from the highest magnification offered. This makes it easy to reference the slight differences between them. Each scope comes with common features like wider but shorter turrets, zero stop technology, and illuminated reticles, but each scope also has its individual characteristics as well.